We will be offering our regular Gaelic language classes at beginner and intermediate level on Saturday mornings from 10:00 am to 12 noon starting Saturday February 23rd, 2019, and continuing for six weeks to March 30th. The Beginner lessons will be taught by Peigi MacKinnon and John MacLeod. These lessons are suitable for new learners with no previous exposure to the language, or as a refresher course for those who have taken the course previously. The lessons will focus on sentence structure and conversational Gaelic, with a little grammar where needed, and an opportunity to learn some Gaelic songs. The Intermediate lessons will be taught by Maureen Lyon. The lessons are designed for those who are already familiar with the basics of the language, and will cover topics such as reading and comprehension of short stories, conversation, grammar, and Gaelic idiom. 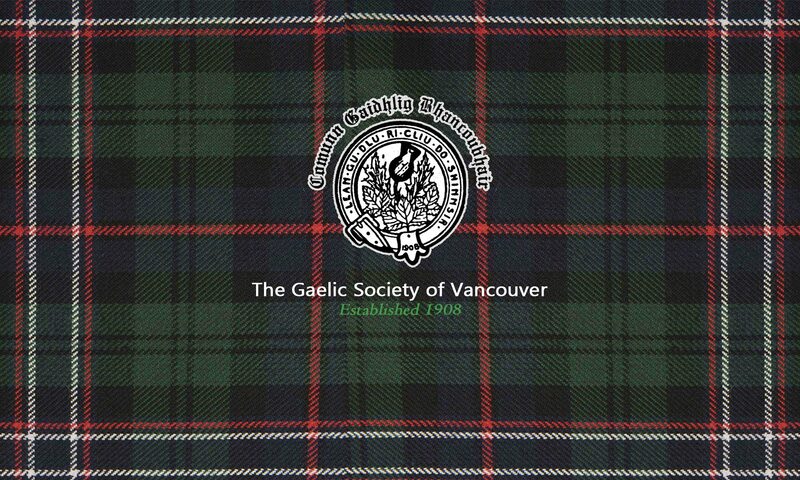 Please contact John MacLeod at vancouvergaelic@gmail.com by February 15th to enroll in the lessons or for any further information about the lessons. An open-mic old-fashioned cèilidh at which Society members and friends can share with us their songs, stories, jokes or other party pieces, whether in Gaelic or in English. All welcome! Special Guests: The Pender Island Ceilidh Band following their barnstorming visit to us a couple years back, they return for another great evening of entertainment! We are also delighted to welcome back The Vancouver Gaelic Choir and Society piper Ed MacIlwaine for this event. Please join us for this our final cèilidh of the season. Saturday, March 16th, 1:00 pm to 4:00 pm. Surrey Celtic Fest at the Museum of Surrey, 17710 56A Ave, Surrey, BC. Be entertained by captivating Celtic music and dancing and get creative with Celtic crafts. Please visit the Society’s table at the fest. Saturday June 15th, come and visit our booth and our Gaelic language presentation at the B.C. Highland Games, Lafarge Lake Park, 1240 Pipeline Rd, Coquitlam, BC (close to Percy Perry Stadium). Thursday June 27th 7:30 pm at the Scottish Cultural Centre. Everyone welcome! All committee and executive positions will up for election and there will be an opportunity to discuss the Society’s program of events for the coming year. Please attend and share your ideas and suggestions for our future Society activities, and assist us by volunteering to help with organizing future events. Please mark your calendars and come join us at the Scottish Cultural Centre for these activities!